When we know what our carbon footprint is then we can act. GRAHAM Construction and Low Level Waste Repository Ltd therefore calculated the carbon footprint of their Engineering, Design and Construction Framework (EDCF). It is important to the framework that once the footprint was calculated that it was displayed in a manner which was easily understandable and relevant to all who work within the framework. Hence the Carbon Footprint Poster which translates difficult to envisage CO2 information into something more tangible i.e. hot air balloons. 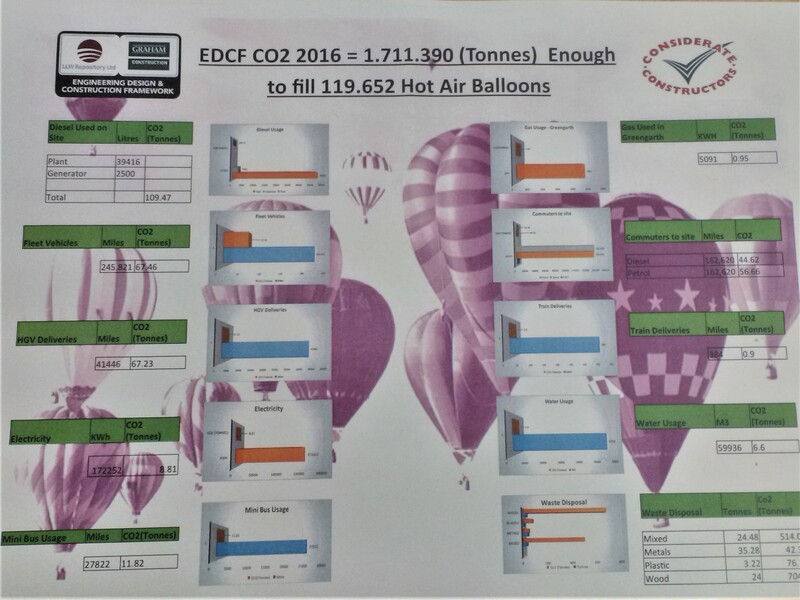 The poster displays the 2016 baseline Carbon Footprint information, which was sourced from using the UK Government Conversion Factors, and a similar poster will be produced every 6 months reporting where our positive actions are reducing our carbon footprint. The poster is a simple way to display important information, but it has the added bonus of acting as a constant reminder as the posters are displayed in prominent positions throughout the site.